We ended up having not 1 but 2 takeaways last week... oops; pizza and chicken. The scales will probably not be kind to me today although it was nice to indulge for the first time in what felt like forever. 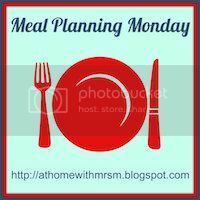 Hopefully the damage isn't too bad and we are back to meal planning minus junk this week (or I shall never shift the extra pounds). The weekend ahead is child-free as the Mini Mes will be with their dad so we are probably going to the cinema and then out to a quiz in the evening with family. I shall nominate myself as designated driver to avoid the calories of alcohol! Your pie looks good too - and easy to make. Thanks for the recipe, I'll use up the gammon lurking in the fridge with that I think! I'd never thought of doing chilli in the slow cooker. I took ours to the tip as the only thing we did in it was pulled pork. Oh well. Hope the scales are good to you. Oh another menu with gammon - it's starting to call out to me as I love gammon, but it's not something we often buy. Yay to cottage pie - a favourite in our house! Have a good week! I love Gammon, seems popular just not in our house!